Perhaps you already have one (or several!) 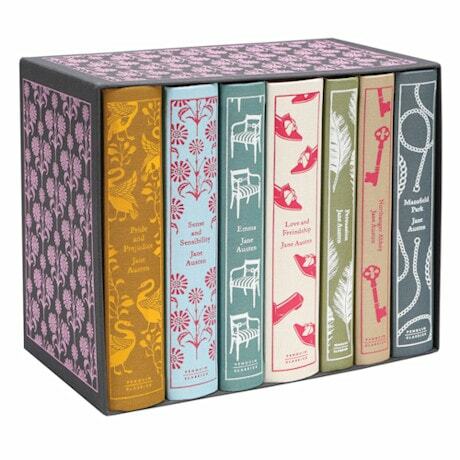 dog-eared paperback copies of your favorite Jane Austen novels on your bookshelf, but trust us when we say you'll want this gorgeous boxed set, too! 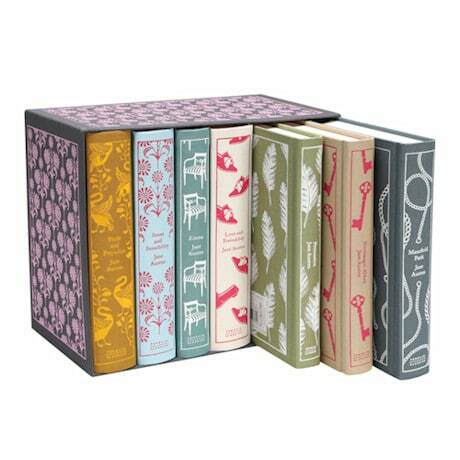 Classic editions of the beloved writer's six novels—along with a seventh volume, a collection of Austen's youthful writings that includes “Love and Freindship” (Austen's spelling, not ours! ), “A History of England,” and other stories and musings—have been bound in handsome illustrated cloth covers. What a beautiful gift for a devoted Austenite, a budding young reader…or you! Also available: The lovely Brontë Boxed Collection features works by all three Brontë sisters: Jane Eyre, Wuthering Heights, The Tenant of Wildfell Hall, and Villette.